Native to Southeast Asia, originating perhaps in Southern China or Northeastern India, and in cultivation for over 4000 years, the citrus genus bears some of the world’s favourite fruit. Although it is commonly agreed that there are around 16 species of these evergreen flowering trees and shrubs, the taxonomy of citrus can be quite confusing and inconsistent. The whole genus is interfertile, giving rise to numerous hybrids, bud unions and cultivars. Even though the fruit is very popular fresh or used in cooking, it is not only the fruit or leaves of citrus that can be eaten – the flowers of lemons (Citrus limon), oranges (Citrus sinensis) and limes (C. latifolia and C. aurantifolia) are edible too! 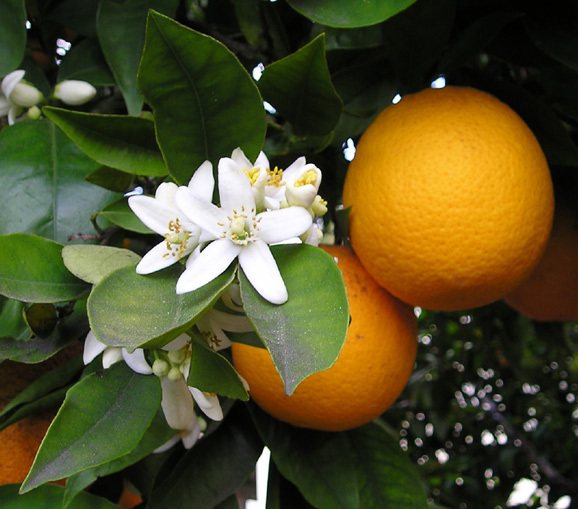 Not so often mentioned, but also listed as edible are other citrus blossoms such as grapefruit and kumquat. Most probably a hybrid between bitter/sour orange and citron, lemons were mainly planted as ornamental plants, or as a medicine. Today the lemon is also prized for its many uses in the kitchen. Not to be confused with Linden (Tilia cordata) flowers (also known as lime blossoms, also edible). Quite sweet and pungent, with a definite citrus aroma, the flowers are added to sweet and savory dishes alike. Used fresh, or can be dried or frozen. Also preserved in sugar, oil or syrup. Infuse honey with blossoms. Add to butters and soft cheeses for a sweet citrus flavour. Orange blossom water is a favourite ingredient in French and Middle Eastern cuisines. Orange blossom or lemon blossom tea is also a lovely warm or cold drink. This entry was posted in Food & Drink, Plant Profiles. Bookmark the permalink.